For my suggestions on natural cleaning products click here and for my tips on using orange essential oil in your home click here. As always, thanks for your efforts in keeping life clear! Oprah is still challenged by too much stuff. 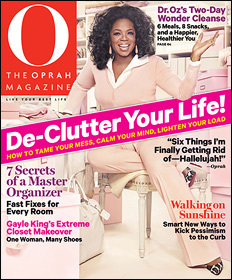 This month’s O magazine features another de-clutter special. The editors bring us organizing tips from Peter Walsh and a peek inside Gayle King’s closet as it gets a major makeover. And the queen herself reveals seven categories of things she has decided to finally live without – from head to toe. My favorite article in this issue deals with beauty clutter and the monster created by all the products we accumulate in our effort to look good. The numbers are pretty staggering: one gal had 169 lipsticks, 33 eye pencils and 39 makeup brushes. Another woman counted 40 hair conditioners and 25 shampoos. Whew! Find out what products made the cut and what got cleared out. Pick up the March issue at your local news stand. Online option: view excerpts from the “de-clutter” issue now.